Professional and complete analysis of the most important water parameters through the Fauna Marin Seawater Research Lab. The Best Concepts are Achieved from Experience! Technology is always changing. New methods, concepts, and practices are often presented in our hobby. Today, more than ever, we are able to analyze our aquariums in ways that allow us to gain a deeper understanding of why we encounter certain issues. Through commercial test kits, we gain limited insight on our tank parameters and are unable to see “the whole picture”. This limitation makes it more difficult to pinpoint the source of a problem. Today, there are water testing services available that help hobbyists see other parameters that cannot be tested by commercially available kits. This involves hobbyists sending a water sample to a specialized laboratory to get tested. After a few weeks, the results are provided and the hobbyist may be left with data that is not easily interpreted. Enter, Fauna Marin. As an innovative company, we are always looking for ways to improve and facilitate fish and coral care for aquarium owners. For this reason, we decided to create our own specialized water testing laboratory, named Seawater Research Laboratory (SRL). The existing concepts provided by other testing services were and are not conclusive enough. What good is the data if the aquarist does not know what to do with it? Unfortunately, it leaves more room for suspicions than real results. With SRL, we look to provide a new standard alongside with knowledge and data that can be provided to the aquarist with interpretations and support after the service. SRL utilizes the latest testing technology and years of experience from qualified professionals to provide a service like no other. When developing our lab, we looked beyond one or two pieces of laboratory equipment. We looked around for the most reliable and accurate system and have thus created a laboratory that has never been seen on this scale with this type of machinery. Our lab works with doctoral scientists who have experience with such equipment and personally take care of the correct analysis for every sample. Rest assured, our SRL will provide accurate results every time. We provide the correct packaging and sample tools for preparing water samples. Our sample kits are made to scientific ISO standards and include all necessary tools to ensure correct sample preparation. Many elements such Iron, Magnesium, and Nitrate u.v.m., change composition while in a sample tube. Some drop out, turn into new compounds, or are reduced from bacteria. As the only provider in the hobby of correct sample preparation kits, we apply all the scientific rules for sample preparation and provide you with the right kit with reusable boxes for waste prevention. SRL will not only provide you with accurate readings, but also grant you access to a unique network of specialists and experienced professionals in the field. With help from our national and international partners, we created an advisory network which allows these professionals to personally take care of you. As an SRL customer, you have the choice to choose any partner within our network! When you place an order through your partner of choice, you get a sample kit, then send it back for analysis. We then create your analysis and in cooperation with your partner, we interpret the results. We or our partners will then provide individualized support and recommendations based on your results. The data can then be stored in a database which can be viewed again at any time. Our partners are subjected to a rigorous selection process. We only accept professional specialist companies with decades of experience in the aquarium hobby. All SRL partners are globally recognized experts and have earned recognition for their innovative developments. Through our partner network, a knowledge exchange takes place under these professionals. This pool of knowledge serves each customer well by receiving personalized advice. Our interpretation service takes into account, the contents of your existing aquarium; livestock, equipment, water quality, products used, etc. With this information, we look at your aquarium as a whole. We seek to help you achieve your goals, not by taking short cuts, but rather by finding the source of the problem and helping you solve it. We note the interplay of elements, possibility of chemical reactions, and the complexity and bioavailability. 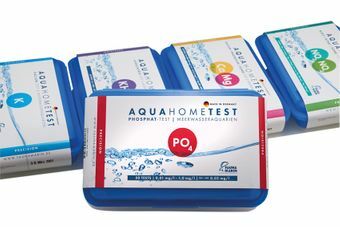 With the correct analysis in conjunction with information about your aquarium, we find suitable dosages for products already in use or suggest a suitable product from our product range or the partner’s range . Receiving truly accurate water test results are key to restoring balance in the aquarium. Dosing adjustments based incorrectly created or misinterpreted analysis values do more harm than good. We are currently working to create an online database so that you can manage your water analysis and aquarium(s). Our online service will also allow you to track the status of your water sample.